"Reader's Theatre is another way to enhance comprehension of a text, as well as to create interest in and enthusiasm for learning." (Kimbell-Lopez, K., 2003). 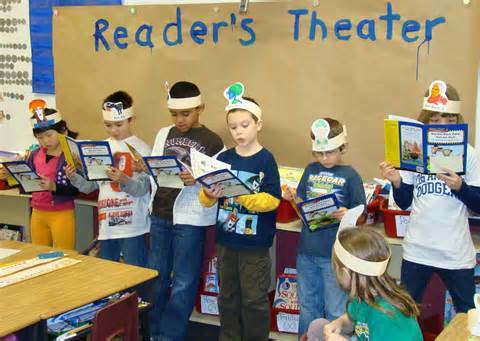 A reader's theatre is a strategy to use in the classroom for a focus of reading. It is much different than a musical or play. In a reader's theatre, those involved read the script every single time instead of memorizing it. Reader's theatres also do not include any props, costumes, or scenery. In a reader's theatre, there is not suppose to be any movements, facial motions, or other acting techniques. It is all about the reading of the script with expression! (Jennings, J., & Lerner J & Caldwell, J., 2014). How can you Implement Writing? During a reader's theatre, most of the components of a balanced literacy lesson/ classroom are covered. Students are reading, listening, and speaking. But what about writing? There is a way to incorporate writing! Once students understand the reader's theatre strategy and how to use it, writing should be incorporated. Students can write their own scripts through imagination or by giving them a prompt. This will help with motivation as well because it gives the students ownership of the work they are doing. (Jennings, J., & Lerner J & Caldwell, J., 2014). (Cornwell, L., 2015). (Kimball-Lopez, K., 2003). What are some Types of Students this Strategy may Help? -This strategy helps students who struggling with reading, mostly in the comprehension area. These students benefit from the repeated reading exercises that increase fluency and comprehension. -ELL Students are supported with this strategy because it works on fostering language development. With ELL students, it is important to make sure they understand and know the meaning behind their lines. ELL students shouldn't be continually reading something that doesn't make sense to them because that won't be as beneficial. In writing classes, students can create their own reader's theatres. This is a great way to engage students because they have some flexibility and independence with the assignment. Give students prompts to begin, but as time goes on and they understand their task they should be able to pick their own prompts. In Reading courses, students can perform reader's theatres for multiple reasons as stated above. One way to incorporate a reader's theatre into Reading class is to do one weekly at the end of each week. The reader's theatre could be a preview of the topics the students will read about the next week, or it could support the topics of that week and be a fun and engaging activity for students to end the week with. 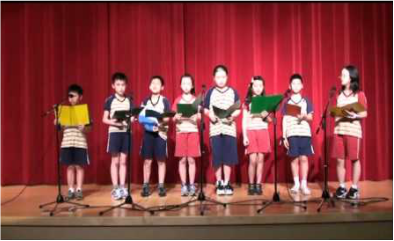 The students will have to take the role on of practicing their script and working on expression. Reader's theatre can be implemented into social studies as well. Reader's theatres are great for explaining people, places, and events through a script. This will help bring the history alive and more meaningful to the students because they are engaged in their learning. Take a look at the video below to see an example of how to incorporate reader's theatres into a social studies course. Cornwell, L. (2015). Scholastic.com for Librarians | What Is Readers Theater. Retrieved October 4, 2015.